This scorcher of a summer is only half over. Are your kids bugging you for stuff to do? If you own an iPad, consider these nicely priced apps to keep their minds engaged and entertained. They won’t even realize they’re learning something! We realize this list is hardly complete, so IMACS welcomes your suggestions for similar apps on any platform. The main criteria, which is how we picked these three, is that the app should introduce some type of mathematical or computational thinking in a very natural and intuitive way. No overt instruction. No drilling. Just clever and fun learning! Cargo-Bot won’t teach you how to program, but it goes a long way to introducing some of the basic principles of computational thinking in the guise of a fun and addictive game. Each puzzle starts with various colored boxes on a platform and a picture of how the boxes should be situated once the puzzle is solved. Your job is to make the robotic arm move the boxes from their starting position to the prescribed ending position using a set of simple of drag-and-drop commands. The trick is to complete the task using the fewest number of instructions. That’s right, you get more points for shorter programs! In addition to surreptitiously introducing the basics of stacking, sorting, looping, if-then statements, and calling another program, Cargo-Bot forces you to think carefully about your “code.” You might succeed in moving the boxes to their correct destination, but with anything less than the ideal solution you’ll come up maddeningly short of the maximum stars awarded. Your program might also cause the claw to do something unpleasant like smash into a wall. You simply can’t help but want to remedy these situations. In other words, the app makes you want to debug your code or make it more efficient. Brilliant! Symmetry Shuffle is a visually beautifully app that tests your spatial reasoning abilities. Use your fingertips to slide (translation), flip (reflection), and turn (rotation) an asymmetric master image across a board made up of similar background images positioned with different orientations. See with your mind’s eye and your actual eyes what happens to the master image under these geometric transformations. Each time you move the master image over a background image so that they match in orientation, the monotone background image becomes artfully colorful. Complete all matches to solve a puzzle. The puzzles can be played in two modes. In Race Mode, you try to score as many points as you can before the clock runs out. One point is awarded each time you make a match. Unused time from the previous level is added to the total time allotted to solve the next level. In Solve Mode, you try to solve the puzzle using the fewest moves. Even the toddler/preschool set could appreciate this game. There is really no need for verbal explanation. The touch commands are so intuitive that a few examples make clear what to do. We’re eternal fans of the ThinkFun’s Chocolate Fix game, both the physical version and the app. (Could it be because IMACS alumus Mark Engelberg is the developer?) This perennial favorite of our students makes learning logic so much fun! The rules of the app are the same as the physical game. Color and shape clues offer incomplete information about the location of each confection in a 3×3 tray. Use your logical reasoning skills to determine where each of the nine pieces go. 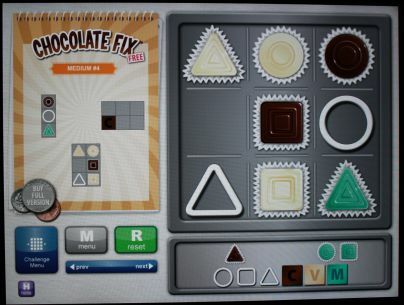 Chocolate Fix Free contains 30 challenges across four levels of difficulty (15 easy, 10 medium, 3 hard, and 2 expert), whereas Chocolate Fix contains 100 challenges at each level for a total of 400. For the very young or the logic novice, one great aspect of the app is that you can click on the “Hint” icon to get just a bit of help. With the physical game, it’s difficult to get hints because flipping over the challenge card reveals the entire solution on the back. Keep your brain active this summer with IMACS! Check out our online courses in gifted math and computer science Register for our free aptitude test. Play along with our weekly IMACS logic puzzles on Facebook.